Mr Galán was not accusing any new entrants in the renewable sector — some of whom are private equity or infrastructure funds — of the kind of false accounting that led to US energy trader Enron’s collapse in 2001. He was instead highlighting how cheap money was pushing some into a business they did not understand. The warning speaks to a wider fear about the potential disruption to global businesses as central bankers start to unwind a multi-trillion-dollar experiment in ultra-loose monetary policy. Nothing to do with “subsidies” drying up then? “Rather than just give flat-rate subsidies to new power plants, companies compete to build new capacity at the lowest possible level of subsidy for any given technology, whether it be traditional fossil fuel-based power plants, established renewables like solar and onshore wind, or less established technologies like offshore wind. The difference between the average price that comes out of the auction and the market price is the bit that the government pays”. 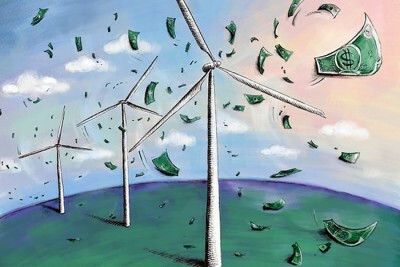 Ørsted is in danger of having to repair the blades of more than 600 offshore wind turbines. “The lowest possible level of subsidy” should be zero. The main thing that is missing from the auction scam is the guaranteed amount of base load power supplied at that price. The government should be saying ‘if you can’t supply base load we are not interested in making up the ‘bit’ between your price and the market price, come back with a proposal when you can’. Unfortunately no one in the government has the guts to say that – maybe the greens know where the bodies are buried or something like that. Before the snake oil con men of “Renewable” energy took control of the political machines, dependable base line power received the premium price and undependable suppliers were greatly penalized with hookup fees and monthly capacity charges, often greater then the value of any power produced. Only dependable suppliers need apply and those that were part of the grid operator’s operation received first consideration. The Paris deal was never going to work to slow temperature increases, all the while coming at a great cost. If it has to be subsidized to come close to competitive prices of supply, it’s a toy. If it can’t provide reliable power, it’s a toy. If the government is involved, it’s a scam. And what guarantees are there that all this useless trash littering the country will be clean-up properly when it all fails? tom, I suspect that the UK will be like the US – rusting hulks filling the skyline. Even if they did take down the towers they will never remove the concrete pads and roads which will prevent the land going back to what it was.